Patna Pirates' squad for Pro Kabaddi Season 6! The franchise based out from Bihar, Patna Pirates is the most successful team of Pro Kabaddi till date with 3-consecutive title wins in Pro Kabaddi Season 3, 4 and 5. The team owned by Rajesh V. Shah Patna Pirates is the only team to appear in the playoffs of all seasons of Pro Kabaddi from the inaugural season itself. With a winning percentage of 60.88%, the team has won 55 times in 93 matches. Over the 5 seasons of Pro Kabaddi, Patna Pirates changed its captain every single season till the fifth season, yet the team is known to be the toughest to beat. As far as the previous three titles go, all of them have appeared by the heroics of the super raider named Pardeep Narwal. A stat reads Pardeep Narwal has scored approx. 29.167% of Patna Pirates' total points since Pro Kabaddi Season 3 (when Pardeep Narwal joined Patna Pirates). 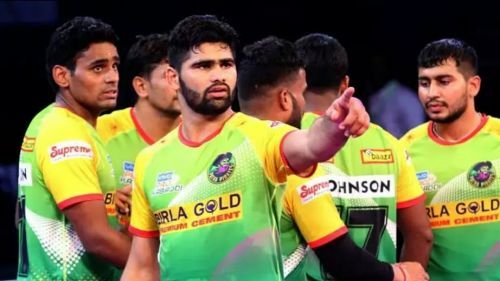 In Season 5 where fans proclaimed Patna Pirates being a weaker team with overdependency over Pardeep Narwal, Monu Goyat established himself as a prime raider. This duo went on to score 571 total points in 26 matches and led Patna to be a dominant side. In the defence, the two new established corners, Jawahar Dagar (right) and Jaideep (left) performed exceedingly well than their experienced cover defence in Vishal Mane and Sachin Shingade. The combined efforts of every department led Patna to win against Gujarat Fortune Giants in the final (55-38) to win their third title. 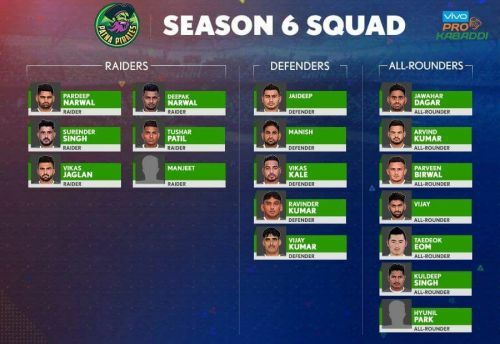 Ahead of the Season 6 auctions, the team retained Pardeep Narwal, Jaideep, Manish, and Jawahar Dagar and let go of Monu Goyat. Vijay, Arvind Kumar, and Parvin Birwal were the team's NYP retentions. For Season 6, Patna Pirates signed 18 players in their squad with Pardeep Narwal being the most paid player at ₹60.5 lakhs. As Ram Meher Singh continues to be the head coach once again with the Pirates, here's the predicted playing 7 of Patna Pirates in the initial matches of the tournament. One of the keys finds for Patna Pirates, Jawahar Dagar was an exciting mix to the Patna's defence in Season 5. An all-rounder who loves to defend more often, Jawahar looks to take the opposition out of the court with his running dash from the other end of the corner defence. He shows numerous moves in his arsenal whether it be diving ankle hold or a frontal blick with upper body force. Jawahar notched up 31 tackle points in 24 matches he played. He'll look to impress his team once again as a permanent right corner defender.